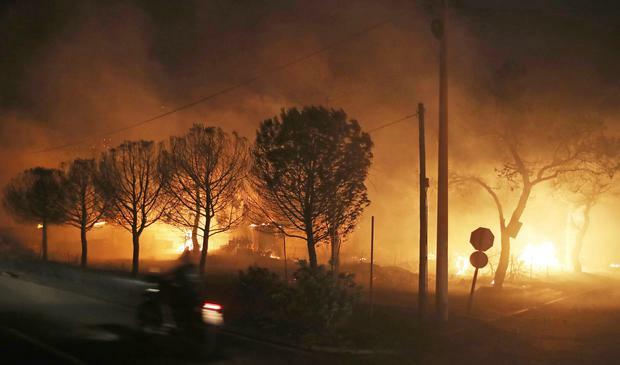 Greece has “serious indications” that arson caused a wildfire that soared near Athens on Monday, killing at least 83 people and injuring scores, Citizen Protection Minister Nikos Toskas said on Thursday. “We have serious indications and significant signs suggesting the criminal actions of arson,” Citizen Protection Minister Nikos Toskas told a news conference. He said police had testimonies to that effect, but did not elaborate. Grief became tinged with anger on Thursday as rescuers searched scorched land and the coastline for survivors, three days after a wildfire destroyed a small town and killed at least 83 people, including Irishman Brian O’Callaghan-Westropp whose body was found yesterday. In a nation numbed by the scale of devastation, desperate relatives appeared on television to plead for information on those missing, while questions mounted why so many were trapped by a wall of flame in streets with no exit route at Mati. It was unclear why there was no evacuation order, with the fire brigade, local administration and central government each saying the other was responsible. After an extensive search, the family of Brian O’Callaghan-Westropp received the devastating news yesterday afternoon that he was among the 83 people killed in the blaze. The Holohan and O’Callaghan-Westropp families released a statement verifying Mr O’Callaghan-Westropp’s death. The cause of the fire is still unclear, but authorities, including an Athens prosecutor, were investigating how it started simultaneously from three different locations and the way it was handled. Furthermore, Greece’s Citizen Protection Minister Nikos Toskas said satellite image analysis and ground inspections suggest the fire that broke out in multiple places in a short time frame on Monday likely resulted from arson.